Hello there, I hope you’re having a good weekend. It’s been a bit damp and grey here in Gibraltar which isn’t the norm for this time of year, but summer’s around the corner and we had a little taste of it last weekend. Sunday Sevens is a weekly blog series featuring seven photos from the last seven days. It’s the creation of Nat at Threads & Bobbins blog. To find out more, pop over to her blog. Here in Gibraltar, we don’t need too much of an excuse to have a party, and May Bank Holiday weekend was the perfect opportunity. The skies were blue, the sun was out and lots of people headed out to enjoy the beautiful spring weather. We made a bee-line for Commonwealth Park so the boys could run off a bit of energy with their scooters. This photo makes it look pretty deserted but I can assure you that there were dozens of other families there doing the same. You can probably see them in the distance on the grass. 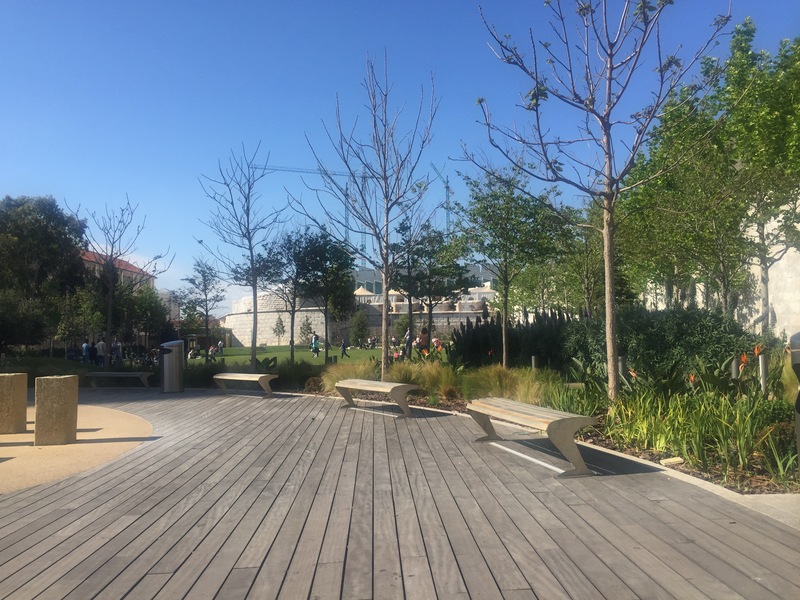 Later in the day there was the added excitement of a free live concert in Casemates Square featuring a series of local acts culminating in Ben Haenow, the X Factor winner from 2014. There was no art class this week so on bank holiday Monday instead of painting, I found myself sitting in the sun and fancied doing a spot of crochet. This little butterfly fluttered off my hook ;-). 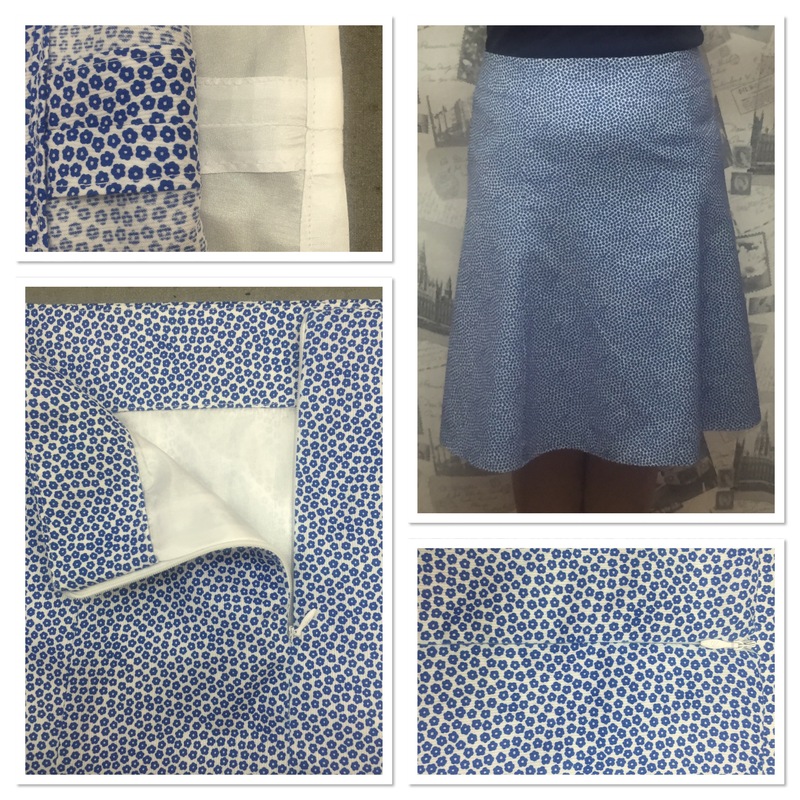 It’s finally finished, my lined panelled skirt with an invisible zip. I’m not sure how much I like the fabric and style now it’s made up, but I learned a lot making it. As I didn’t have watercolour class this week, I did a bit at home. I’m pleased with how my window’s coming along. I’ve managed not to spoil it…. yet! So far this week with school closed 3 days out of five here (bank holiday Monday, Acension Day on Thursday and In-Service day on Friday) I only managed one single trip up the Med Steps. It was perfect conditions, overcast and cool, so I did it in a good time. However, now I’m getting a bit worried that it’s less than a week to go to the Med Steps 5 Challenge on Saturday and that scares me a bit! 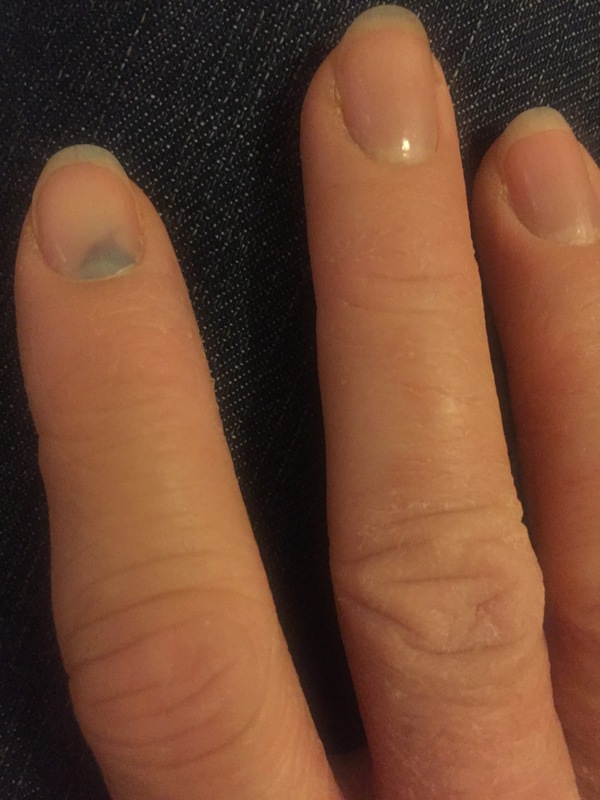 On Friday night my right index finger had an argument with a pair of doors and lost. On Saturday I woke with a blue nail and swollen finger and felt rather down in the dumps as I’d spent much of Friday busily doing jobs so I could do some crochet on Saturday. Unable to pick up a hook, I decided to read instead and began Empty Cradles (Oranges and Subshine) by Margaret Humphreys. It’s not the cheeriest read to lift the mood but is incredibly powerful. It tells the true story of the hundreds (if not thousands) of British children who were shipped overseas to Australia, New Zealand, Canada and Rhodesia from the 1940s until the late 1960s. They were sent away from children’s homes in the UK to help populate areas and work the land, with little hope of seeing their families or homeland again. If you are interested I social history, I can highly recommend it. 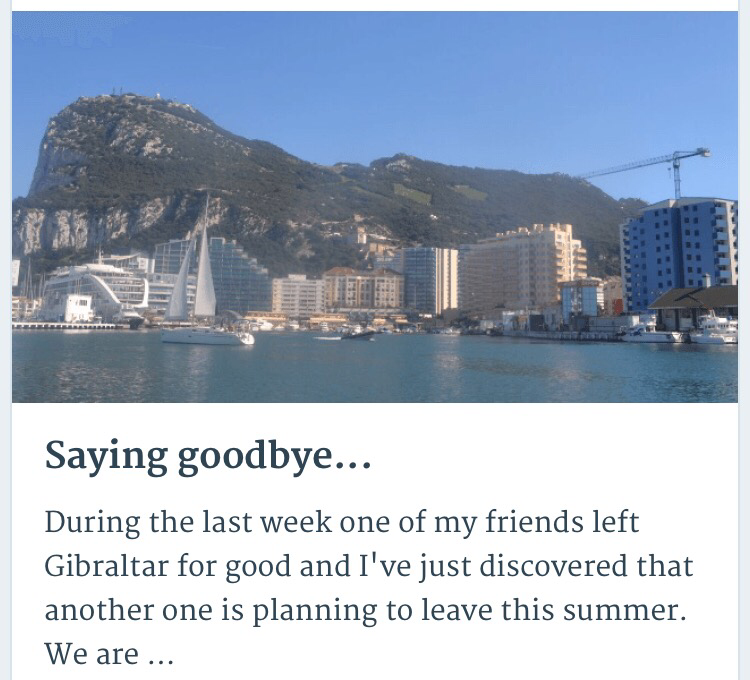 When I pressed publish on my last post Saying goodbye on Wednesday morning, I was slightly nervous about putting out such a personal account. I was overwhelmed by the response to it, both on WordPress and Facebook, and I would genuinely like to thank you for taking the time to read it and those of you who sent messages afterwards, it was very much appreciated. We are really blessed with the wonderful community we have here in Gibraltar and from what some people have told me, it’s a sadly rare occurrence. I shall treasure the friends I have close by and am confident that those who have moved on to pastures new will continue to play a part in our lives either online or through visits. All is not lost! 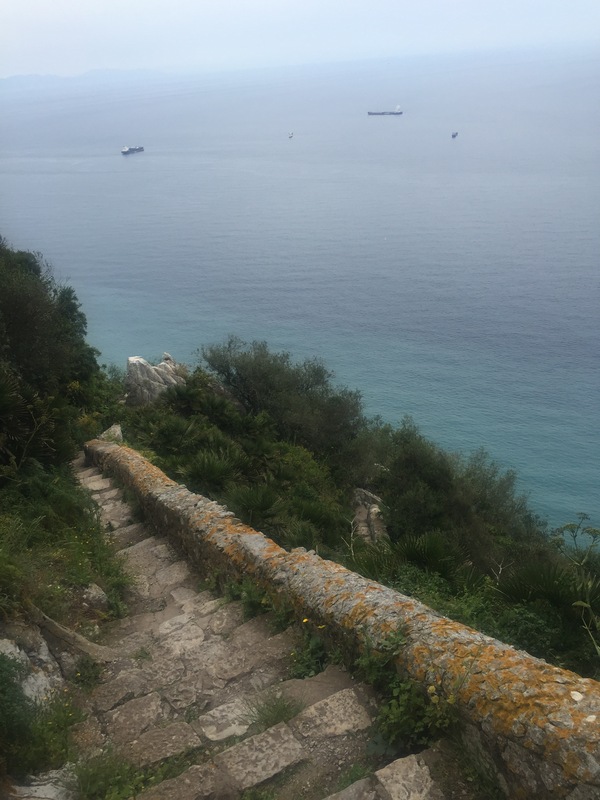 I’ve been in Spain for the last 12 days and one night I dreamed I was walking (not running) up the Rock and there was a huge drop on my right (as in reality there is). I’m sure it was that photo the other week of the Med steps! Skirt is looking very neat. Did you machine or hand stitch the hem? Photos played up on the blog but I found them through the gallery view. Friendships are funny. Being childfree I never experienced the school gates thing, but as we lived in busy middle class suburbs/villages/towns we had quite a lot of friends who were neighbours. Plus some from work. In Spain, our nextdoor neighbours are our closest friends; in Gib, we have more acquaintances although I’d call our neighbours opposite friends. Anyone who sends me a huge flower arrangement in hospital has to be a friend 🙂 We don’t particularly mix with the expat (sometimes transient) community in either place though. Probably speaking Spanish negates the need for that in Spain. Even Gibbos do us the occasional courtesy of the odd few words en español. I’m sorry if my images are invading your dreams!! That’s a bit scary! I cheated and machine stitched the hem, the fabric was thin and a bit prone to fraying so machining seemed a better option for a thin, less visible hem. Thanks for the painting compliment- I really enjoyed doing it and managed to find a few hours one evening whilst young postcards were amused and behaving to get a good run at it. I’m not sure about an exhibition though, apart from the fact I don’t have enough paintings to exhibit, have you seen the standard of many of the artists here? The bar is set very high!! I wonder why the photos were playing up for you – sorry about that. I have no idea why – and I have no technical abilities in such things. Please let me know if it happens again. Friendships are funny and completely subjective. I can’t really imagine what my social circle would be like had I not had children as most of mine are in the same situation as me. I guess workplaces help in that regard although I always seemed to live a fair drive from work (60 mile round trip to my last job) so that kind of limits post work gatherings and weekend socialising. I definitely think anyone who sends flowers to you in hospital HAS to be a friend :-). Good luck next Saturday. I love your painting, the shutters and railings are really very good. Hi, I really like your skirt, it’s simply perfect. You can dress it up or down. It’s a classic A line pattern, perfect for summer. Sorry to read that you have a couple of friends leaving you, be positive they are always in your thoughts and heart. Not to mention an e mail away. The watercolour is so beautiful! Do you sell your work? I can see that selling very well. I’ve seen the film Oranges and Sunshine. It was incredibly moving and I imagine the book will be even more powerful. I’m glad your post on friendship got such a good reaction. It deserved to. I’ve still been thinking about it over the last few days. Another lovely Sunday Sevens! Your skirt is pretty, your watercolor window is great! When I saw the post (which I hadn’t yet read) titled “Saying Goodbye” I thought immediately that you were leaving blogland! I was happy to discover that wasn’t the case, but understand about losing your friends. I have no doubt you’ll stay in touch, and that new friends will be arriving to fill the void. Oh, and hopefully your battered finger is healing up nicely. You have a perfect week, sewing, painting and socialising in the sun! Your skirt looks wonderful, great finishing – all neat and beautifully constructed – my early sewing was so bad I could not wear it, so well done! I hope your finger is better. I love your painting – I don’t paint myself but it looks as if you have real talent. Like one of your other commenters, I haven’t read the book but saw the film ‘Oranges and Sunshine’ and was scandalised that this could have gone on in relatively recent history. A very moving and disturbing story which needed to be told. Ouch! to the finger – I hope it’s feeling better now. Hello there, thanks for that. I really enjoyed doing it. 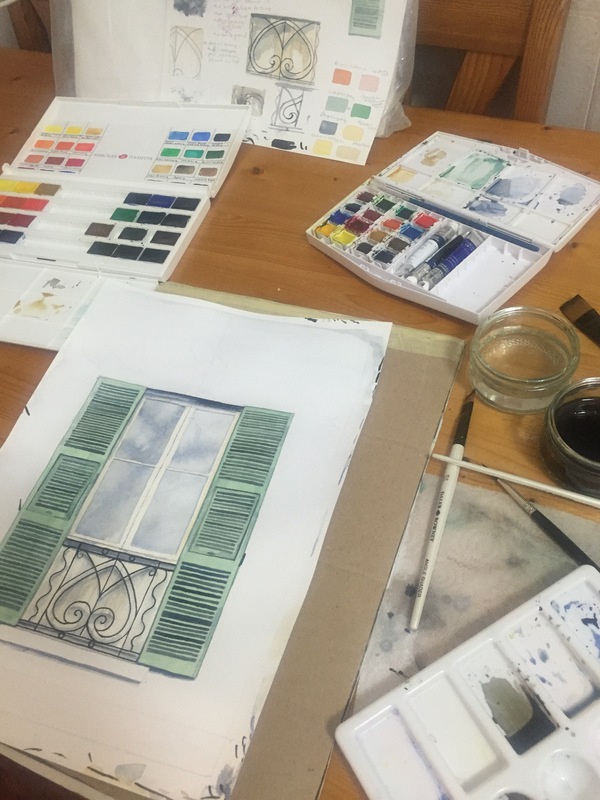 It’s fun learning a new skill as I never did much painting before starting this watercolour course. Yes the tale about these children is utterly shocking. As a parent I cannot imagine what it must’ve been like for the families and as for those poor little children – it’s just horrendous. 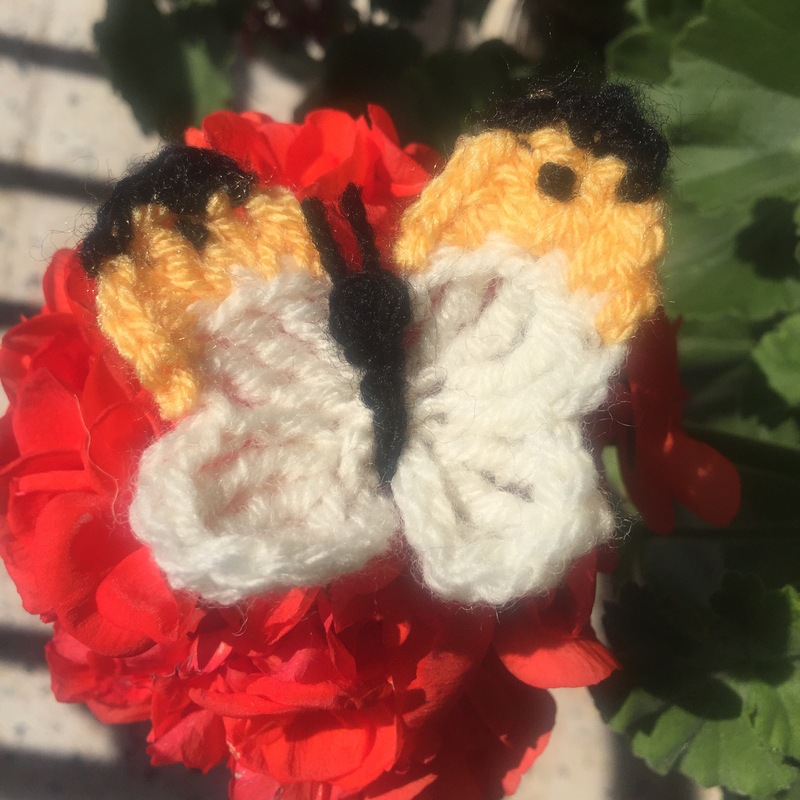 Love your crocheted butterfly. Really so cute! Great skirt as well. Love the colour too. I think the skirt is lovely. And I love the watercolour, it’s very good!